Get out the white cornmeal and cream cheese and start slicing the strawberries. Even if you've never made arepas before, you're about to become a pro. Mix water and salt in large bowl. Gradually stir in cornmeal until blended. Add cream cheese, brown sugar and anise seed; mix well. Let stand 5 min. Divide dough into 6 equal pieces; shape each into ball. Flatten each into 5-inch patty, rounding edge by moistening lightly with water, if necessary. Heat griddle to medium-high heat. Add patties (arepas); cook 10 to 12 min. on each side or until golden brown on both sides. 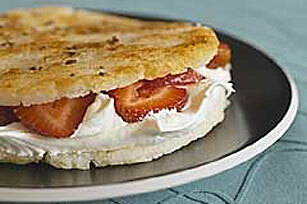 Cut arepas horizontally in half; fill with strawberries and COOL WHIP. To talk about arepas is to talk about Venezuela. Arepas are served for breakfast, lunch and dinner at any Venezuelan table, usually plain with butter and Apure (Venezuelan cheese). They can be grilled, fried or boiled. Arepa dough can also be used to make other Venezuelan delicacies, such as empanadas and hallacas (Venezuelan tamales). Prepare and shape dough as directed. Cook patties (arepas) on griddle on medium-high heat 5 min. on each side or until lightly browned on both sides. Place arepas on foil-covered baking sheet. Bake in 350°F oven 12 to 15 min. or until done. Split and fill as directed.